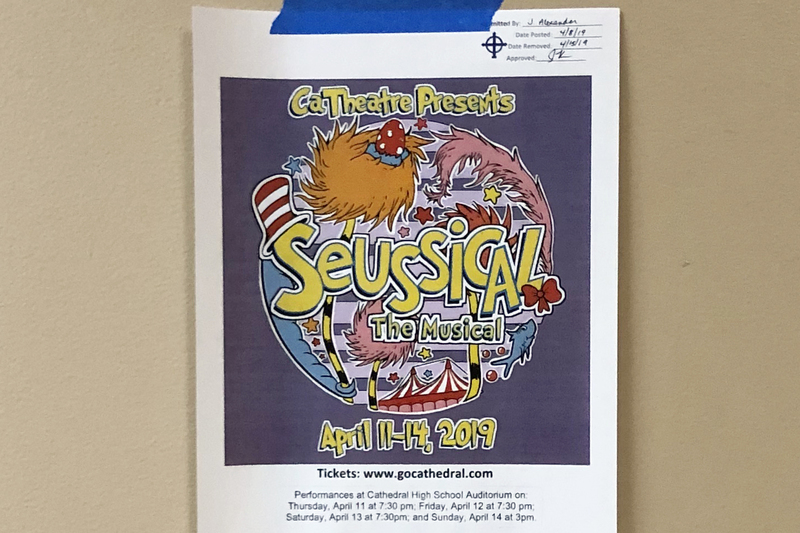 Posters throughout the school promote "Suessical," the spring musical. As CaTheatre prepares for the upcoming spring musical, “Suessical: The Musical,” seniors such as Mary-Benning Cannon approach their last musical of their high school career. Cannon, who serves as one of two stage managers, said she organizes rehearsals and calls the show. “Anything that moves, any lighting, any sound cue, I’m the one saying ‘sound go,’” Cannon said. Every year, the people involved in a theater production change, Cannon said. “We have a really vibrant cast,” Cannon said, describing it as energetic and motivated to work. Dedication is an important trait in a production cast, in large part due to the time required. For about three months, cast and crew members work for three hours, five days a week, Cannon said. This results in about 600 hours, she said. This excludes tech week, with famous late night rehearsals. Cannon said the cast and crew are excited for the final results of their work. “Come see the show,” she said. The show will be performed in the auditorium April 11 at 7:30 p.m, April 12 at 7:30 p.m., April 13 at 7:30 p.m. and April 14 at 3 p.m.